Why do I need Sotrender? Sotrender is not only bare-bones numbers – we give you data-driven tips customized to your profiles. Tips are based on your performance as well as your competition. You can read more about Sotrender’s tips on our blog. What’s more, you can observe any of your competitors profiles and learn from both their successes and their failures. We also offer easy & fast reporting – based on our automatic PDF reports. You can also choose a time frame and export charts into graphic files and data into Excel. We even give you access to historic data prior to the start of using Sotrender (and this includes your competition). Other noteworthy features of Sotrender are our advanced indicators of reach, engagement, and customer service, as well as identifying the most engaged users on your channels. Remember, social media is not limited to Facebook alone. 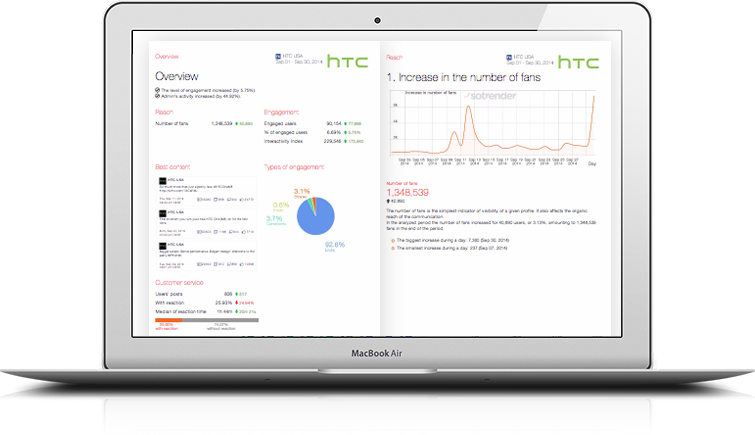 Sotrender offers statistics for Facebook, Twitter, Instagram, and YouTube, all in one place. And we’re working on adding as many new and relevant platforms as we can.